Noah Smith wonders if "reality might topple a beloved economic theory". Well, if you look at Sweden, reality just confirmed that beloved economic theory. The Riksbank raised interest rates because it was scared that low interest rates would cause financial instability. Lars Svensson resigned in protest. Then inflation fell, and the Riksbank needed to cut interest rates even lower than before. That's only one data point. But there are loads more. Is a need for fiscal stimulus a symptom of a poorly-designed social safety net? In the debates on the need for a fiscal stimulus, both sides generally agreed that this particular policy instrument is one of the clumsiest available to policy makers. The dangers are well-known and well-documented: getting the timing wrong, getting the targets wrong, political interference, the risk of seeing a temporary spending program turn into a permanent one, et cetera. Those who advocated stimulus accepted all this, but argued than once monetary policy hit the zero interest rate bound (ZIRB), it was the only counter-cyclical measure available to us. But here's a question: Why was a discretionary fiscal policy necessary? Why weren't the automatic stabilisers enough? The Nordics in the global crisis: [T]he Nordic model itself contributes to resilience. The comprehensive safety net, one of the attributes of the Nordic model, has proved to be robust also in times of crisis. The entitlements are not tied to the fate of individual companies or particular markets, and risks are widely shared in the society. While forest plants are shutting down in Finland and car manufacturing is sharply contracting in Sweden, the governments are firmly rejecting requests for support of ailing industries. Still, there are no crowds protesting in the streets, largely because flexible work arrangements, based both on general and company-specific agreements between businesses and labour, alleviate a rise in unemployment. Structural change is enhanced by the employment protection legislation, which is more liberal than in most other EU countries. A well-educated labour force, another of the attributes of the Nordic model, facilitates adjustment by making it easier to upgrade skills through additional training. Why doesn't our fiscal stimulus look like this? Wouldn't these sorts of programs be a better use of public money than setting up photo opportunities with oversized cheques? In the next budget, let's impose a six-point increase in income tax on those earning more than $250,000 a year (whose average taxable income is $600,000). While leaving them with very high incomes, this would provide $3.7-billion in additional revenue. All of this should be used to increase the National Child Benefit Supplement and thus help our poorest children. With this single act, we would significantly make up for two decades of neglect and make a major dent in child poverty. I'm happy to endorse the $3.7b increase to the National Child Benefit Supplement - the costs are small (less than 2% of federal spending), and the gains are huge. But for reasons I'll explain shortly, the tax proposal is not particularly persuasive. Why is it that Finland, Sweden and Denmark have almost wiped out child poverty, and we have not? Below the fold, I'll try to provide a partial answer to that question. And I'll explain why the conventional Canadian Left's preoccupation with using the tax system as a way of dealing with inequality and poverty should be rethought. The countries are arranged in ascending order of inequality in disposable income, and the Nordic countries take four of the top five positions. 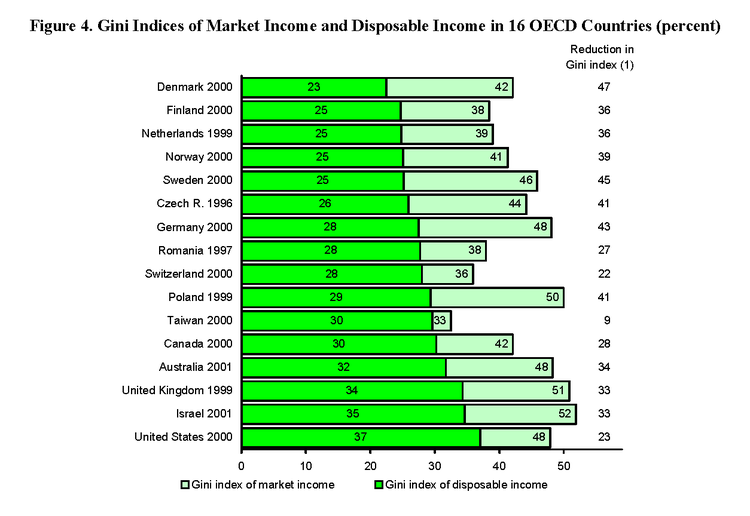 What strikes me is the extent to which this is due to government policy: the Gini coefficient for market income in Canada is the same as Denmark's, and is quite a bit lower than in Sweden. Indeed, Sweden is closer to the US than it is to any of the other Nordic countries. A recurrent theme in discussions of the Nordic model takes the form of "That's all very well, but those policies won't work here without [insert some feature of Nordic countries here]." Libertarian types who would otherwise approve of the free market dynamism of the Nordics assert that the Nordic model can only work in small, homogeneous countries. As a general argument, I'm not convinced - but I can see why it would be hard to export the Nordic model to the US. At the other end of the spectrum - those who would otherwise approve of Nordic levels of spending on social programs - some (eg: this commenter) point to the role of trade unions. But it's hard to conclude from this chart that union density matters much when it comes to reducing inequality. For example, look at Germany (where unions play a crucial role in setting wages) and the US (where they are decidedly less important): both have identical levels of inequality of market income. The distribution of disposable income is lower in Germany because of its redistributive policies, not because unions are more powerful. That's not to say that cross-country institutional/cultural idiosyncrasies aren't important; they are. But there's little reason to believe that these factors have to be changed before the Nordic model can work. Megan McArdle ponders the Nordic model, and gets pretty much everything wrong. She indulges in the oft-repeated and almost-never-substantiated claim that "things that work in small homogeneous countries don't work in big, heterogeneous ones". The Nordics are applying standard textbook rules of taxation. There's nothing exceptional about that. Germany is cited as evidence for the above point. Germany's problem is inflexible labour markets, not heterogeneity. Flexible labour markets are part of the Nordic model. The US really is exceptional when it comes to tax policy: it's the only OECD country that doesn't have a broad-based consumption tax. Alone among rich countries, discussions about US tax policy are framed as higher taxes = slower growth. 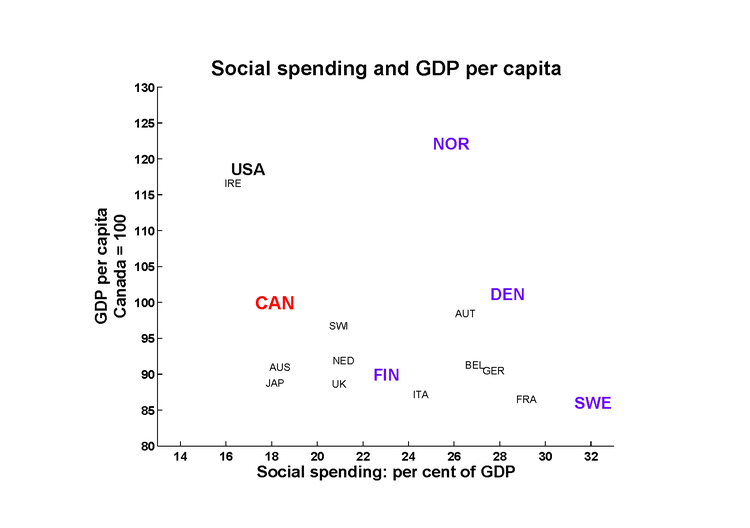 These are the slides I prepared for the session on 'Taxation and Social Democracy', organised by the Progressive Economics Forum at the Canadian Economics Association meetings; the invitation was based on my blog posts on the nordic model. One of the things that distinguishes blogging from research is that although academia frowns on recycling ideas, the blogosphere seems to thrive on it. So nothing here is really new: it's in the textbooks, several blogs, and described in great detail in Peter Lindert's Growing Public. But since I took the time to prepare the presentation, I'm going to post it here. Update: Marc Lee reprises his role as discussant. Here's hoping that more and more presenters will find a way to post their seminar slides (which are generally easier to follow than the papers they're based upon), and that more and more discussants will post their comments (which are generally an easier way to understand what the paper is really saying). Why focus on progressive taxes and not on progressive transfers? Many posts in the economics blogosphere on the subject of progressive taxation today: Greg Mankiw discusses this paper, Mark Thoma points us to a WSJ article, and Brad DeLong links to Mark's post twice (here and here). Inequality - both its level and the rate at which it has been increasing in Canada and the US - is a serious issue. 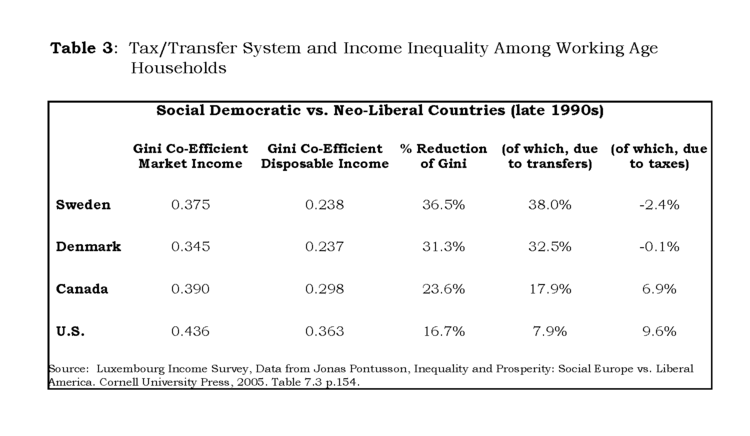 But taxing the rich (and dealing with the resulting incentive effects) isn't the only policy instrument at our disposal; we can also reduce inequality by directed transfers to low-income households. I've just ordered the Pontusson reference upon which this table was based, so I'll come back to this point as soon as I can. But it looks very much as though the Nordic countries - which are rich, devote a large fraction of their income to social programs and which do fairly well in reducing inequality - seem to have given up on tax policy as an instrument for income redistribution. In some circles (such as on the pages of the National Post), whenever the virtues of the Nordic model are cited, a standard riposte is "What about Ireland?" Well, indeed. When I was putting together the graphs for this post, I found that Ireland was quite literally off the chart. The 'Nordic model' has many admirers, and I'm one of them. It appears to have the best of both worlds: the wealth that markets provide best, combined with the social programs that governments provide best. As I noted earlier, there's no obvious tradeoff between these two objectives: we can have both, if we want. For many, this may seem to be a surprising claim, but it's really just a result from basic textbook economics. So where does the notion that generous social programs mean lower economic growth come from? Because a large govt sector requires correspondingly large tax revenues. The story as it is usually told goes as follows: Increasing taxes distorts incentives. If people face higher tax rates on employment income, they will work less. If investors face higher rates on capital income, they will invest less. Since both factors of production have been reduced, output goes down as well. Conclusion: raising taxes will reduce output and total income. That story is correct, so far as it goes.